I have been ignoring my blog and more than that my diary. I had not written my diary for almost a month after I landed in USA. So many thoughts went unwritten, so many emotions went unnoticed, and so many words just disappeared into mantle of forgetfulness. Relationships changed, new ones began, old one’s revisited and so many beautiful things felt and of course many tiring thoughts bothered. How I ignored my diary and my blog without updating my fun, my thoughts. I thought I need them no more, I thought I needed my diary less, but so wrong I was; I need my diary as much as I need to breath; I love my blog as much as I love my moments. And here I was thinking that I can just transfer my thoughts, deliver it at some other doors, but so wrong I was, to think so. My diary and blog is my best friend after myself and they can never be replaced. It is as true as the sky, the ocean or the sun. Ones best friend is none other than oneself. So without wasting any more time, let me just brief you on what I have been doing in the US. 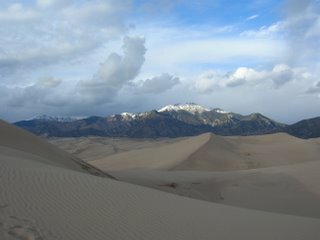 One of the weekends we went to Sand Dunes National park. Isn’t it fun to watch a big heap of sand in between the greenery and mountains? Well for me the most exciting in the trip was, we got lost. We had some wrong map, or should I say correct map for wrong car. We had taken prints of a map that were suggested for four wheel drives, since they were primitive roads for a nice drive through the mountains. So in turn we did some research to go on a different way that again took us to some bumpy roads, making its way through small villages and forests; which was the fun part of the trip for me. And of course climbing up the Sand dunes. I was unable to climb till the top last year, as it was terribly windy back then. But this time, I made it till the top, which was really tiring but once on the top, it’s all worth the pain. That’s what hike’s does to you; makes you go through the pain and then allows you to relax in midst of breath taking views. That was the only trip I went on, other than Glenwood Canyons. I am not in a mood to travel a lot this time. I did have other plans, but they too died off due to some reason. I miss Bangalore and my family and friends there and this thought has made me eager to go back as early as possible. I met a couple of friends from US and it felt so good to speak to them after one long year. Spoke to a good friend from here, speaking to whom is always a great learning experience. He is a wonderful human being who enjoys life to the fullest. Met another friend and her boy friend at Poor Richards Restaurant in Colorado downtown. Both teach in an university. It was fun talking to them about literature and their researches in respective fields. It’s very difficult to find someone who enjoys what you talk with the same spirit, who does not think you are crazy when you speak out your inner depths, inner thoughts. And this conversation was in the same manner fun, it was very nice to share opinions about one common interest. Poor Richards is the best coffee shop I have been to in the US, maybe because of the company and talk we shared. But the ambience is excellent. Attached to the coffee shop is a book store where you get good second hand books for very few dollars. I found some Virginia Woolf books for $2. Met another friend over lunch, who guides me to take proper decisions in investments. And met some other wonderful people from office. :-) No i havent seen the old movie. So I never got to compare.